The general mantra each new year is out with the bad, in with the good, applicable to all areas of life. For most, though, resolutions center around the diet and cutting all waist-augmenting fare. The green tea concoction starts with soy milk and an "enlightened" dairy base of nonfat milk, whey protein and Splenda. This is whirled with Matcha green tea and sorbet. The berry smoothie mixes passionfruit-mango juice and the dairy base, along with mangoes, strawberries and peaches for a dose of vitamins C and A and calcium. Neither are as sweet as the high-calorie drinks, but no one said keeping resolutions is easy! Jamba Juice is also trying to get your year off to a good start by offering chances to win spa or golf getaways worth $400, with one winner each on Oahu, the Big Island, Maui and Kauai. Visit www.jambahawaii.com by Jan. 20 to enter. 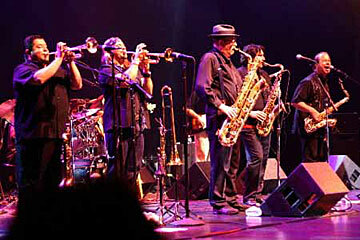 What with twentysomethings rediscovering soul and funk music of the '70s, I was surprised of the lack of a younger audience at Tower of Power's concert at the Sheraton Waikiki's ballroom back in 2003. I thought it would be the perfect live setting to experience the groove-ful music they had only known from old-school vinyl LPs. Well, they have no excuse now with the band's return this weekend at the Blaisdell Arena, complete with two dance floors. And with new singer Larry Braggs, whom original member Emilio Castillo calls "the best singer we've had since the '70s" (i.e., the magnificent Lenny Williams), the "Oakland Stroke" should be in effect. Brew Moon Restaurant and Microbrewery held its own on Honolulu's nightlife landscape a few years ago, mostly based on crowds at its Sunday night "Dark Side of the Moon" party. Well, Sundays have long since fizzled out, but Brew Moon is back with an impressive one-two party punch on Fridays and Saturdays. New Year's Eve weekend brought the debut of "Rockstar Fridays," which had lost its venue when Hard Rock Cafe suddenly switched to a 21-and-over venue late last year. This weekend also marks the soft opening of "Refine" on Saturday. Grand opening is set for Jan. 28. Click for online calendars and events.